Keeping up with the changing laws about Medicaid is a dizzying, overwhelming task. Medicaid is a political football at the federal level, and states are regularly applying for waivers with the Centers for Medicare & Medicaid Services (CMS) to tailor programs to their needs. How do you keep track of the bewildering and complex rules so you can stay compliant with a program that represents such a key source of revenue to your facility? We asked in-house expert Marie Hinds, Parallon’s director of government relations (Medicaid Eligibility), to share her approach to helping clients stay up-to-date on Medicaid eligibility regulations. Q: What are some of the key challenges facing hospitals as it relates to Medicaid eligibility? A: There are a whole laundry list of challenges, but here’s what I keep an eye on: I watch the federal government around issues where there may be changes from CMS. With so much talk about healthcare at the national level, I’m constantly keeping an eye on possible changes. There is a lot more to keep track of on the state side. The Trump administration and U.S. Secretary of Health and Human Services has promoted the use of the 1115 waivers, which allows for changes to state-specific Medicaid programs that is not in federal law. The U.S. Secretary of Health and Human Services (HHS) can grant the waiver as long as the intent of the waiver request is deemed to assist in the promotion of the objectives of Medicaid. 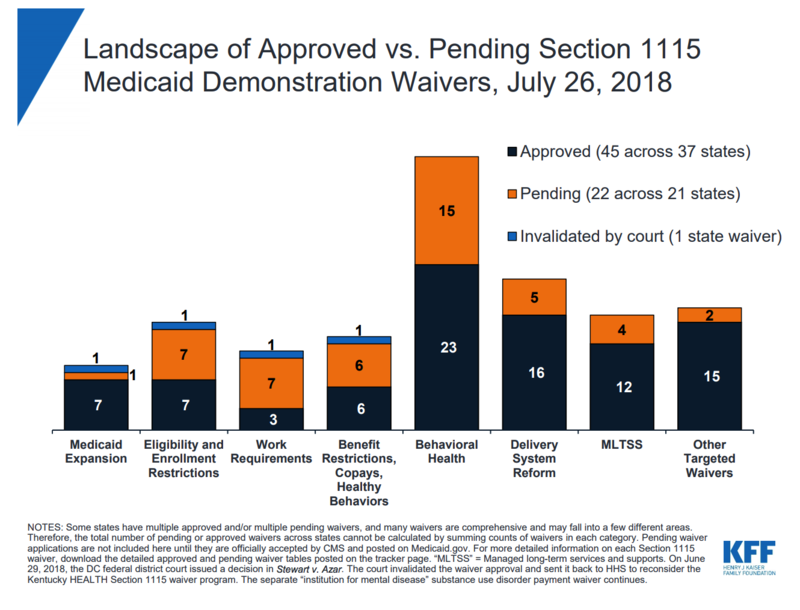 One of the most highly publicized 1115 waivers was in Kentucky, where the governor wanted to institute work requirements to be eligible for Medicaid. While approved by HHS, the requirement was struck down by a court, and it is back in the hands of the federal government. In my role with Parallon, we are working with clients in 22 states and keeping track of the status of their 1115 waivers (SEE CHART BELOW FOR A RECENT BREAKDOWN OF THE STATUS OF 1115 WAIVERS). As the laws governing these programs shift, those laws have a profound impact on the ability of hospitals to capture Medicaid revenue retroactively, as well as moving forward. We keep on top of the changes to help our customers, who often don’t have the resources to track like Parallon can. Q: What kind of changes are happening at the state level with 1115 waivers? Are you seeing some common issues? A: Absolutely. A few of the most common are in behavioral health, enabling payments to different healthcare models for treating mental health and substance abuse issues. Delivery system reform waivers are the next most common approved waiver requests. Sixteen states have approved waivers related to new reimbursement models focused on value-based care. For Medicaid eligibility specifically, perspective work requirements are gaining popularity along with other eligibility enrollment restrictions, which include waiving retroactive Medicaid, implementing premiums, and adding a lock out period for non-compliance. We track all these at the state level while they are pending and once they are approved. Q: How can Parallon’s advantages of scale be helpful to the compliance issues around Medicaid eligibility? A: When there are challenges with one state, we reach out to the Medicaid director and have face-to-face meetings with him or her about the challenges that we are seeing. We can provide those directors with the perspective of hospitals and health systems when it comes to Medicaid requirements. We want to add that perspective to the conversation when discussing what is in the best interest for a state’s program. We aren’t just reacting to problems; we’re participating in the conversation. That is possible because of our size and reach.